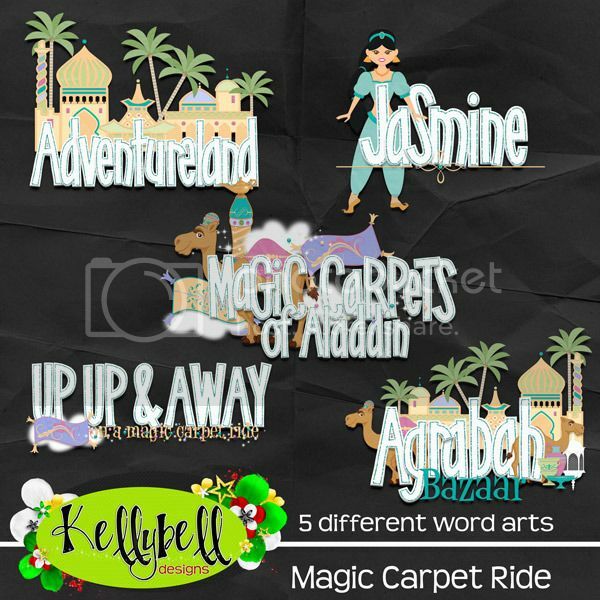 Scrap Out Loud: Go on a "Magic Carpet Ride" with Kellybell Designs! 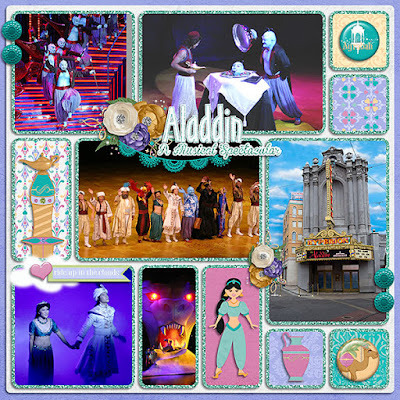 Go on a "Magic Carpet Ride" with Kellybell Designs! Princess Jasmine is incredibly independent and strong willed. She's not afraid to speak her mind and stand up for what's right. Jasmine and Aladdin share a strong bond and make such an attractive couple, it's so special to meet them together at a Disney Meet and Greet. Kelly's new collection today is all about that royal couple. It's called Magic Carpet Ride. Wow, such pretty colors! Inside this kit you'll find 15 papers in lovely pastel shades with beautiful patterns and textures. For elements, you'll get camels, hearts, banners, palm tree, vases, flairs, flowers, magic carpets, lantern, bazaar, foliage, clouds, genie lamp, sprays, stars, tags and more. Plus there's a sweet white alpha outlined in teal. For accessories, Kelly has made some page starters, word art titles and journal cards. These are just adorable! You can find all of these new items inside the Kellybell Designs Store. Grab them this weekend while they are priced at 25% off. 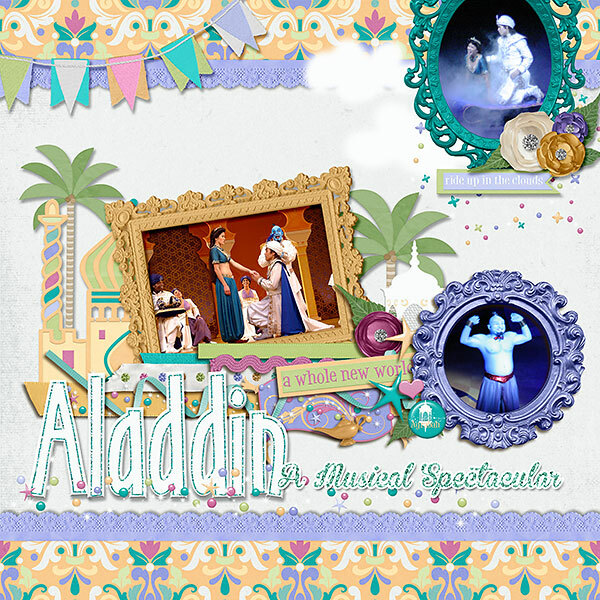 This collection is perfect for scrapping photos of Aladdin and Jasmine. The colors are so pretty! Take a look at what I made. I loved this kit so much I made two layouts! Want to grab some matching freebies with this collection? You've made it to the bottom of the blog post, so now you're ready to find out where they are. Kelly's Creative Team has made 3 beautiful freebies for you. Here's the path. Have a great weekend and have fun scrapping! Pocket Princess from Kellybell Designs! I'm a Guest CT at Kellybell Designs!!!! !